8 April 2010, at 9:33a.m. 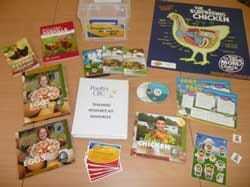 AUSTRALIA - Requests for the Poultry CRC's Teachers' Resource Kit have been coming in so thick and fast that the CRC has had a hard time keeping up with orders. Even the publishers of some of the books included in the kit are struggling to keep up with demand. With the resurgence of poultry keeping making news around the country, it is hardly surprising that students and teachers are using Poultry Hub more often and coming across the kit when they do. EChook News reports that the Teachers' Resource Kit is packed with tools and resources developed by the CRC, the Australian Egg Corporation and Australian Chicken Meat Federation, along with a number of other publications chosen for their relevance to Australian conditions and user-friendly content. CRC staff are busy collating all the materials for the kit, and hope to send out the next batch of kits soon. Resources on Poultry Hub designed to supplement the kit are under development, including the new poultry breeds section which is progressing well thanks to the support of Australia's numerous poultry clubs and their dedicated members. The CRC is also continuing to work with teachers and education experts to expand the range of classroom activities that teachers and students can access from the kit and Poultry Hub. For more information about the Teachers' Resource Kit, click here for the schools page in Poultry Hub's Education and training section.